Once upon a time there were many dozens of types of witch archetypes, more than most writers today would ever imagine. At this time a witch was a person who worked with the fairies (spirits) in order to gain their powers. The beserker's berserk state comes from being possessed by a spirit known as the dyr-fylgja, which allows the berserker to enter battle with the ferocity of an animal, and supernatural strength, speed, and an immunity to damage. While other berserkers are able to send their souls from their bodies in the form of animals in order to engage in battle. Both of these powers require an incredible amount of mental discipline, which comes from contemplative meditation. So while they were extremely brutal they were also highly meditative and mentally sharp. Rather than being chaotic, as is so often depicted, these witches were often willing to follow their leader and their societies laws to the death. Yes they might lose control while possessed and in this berserker rage kill even their own comrades, but this isn't who they were, any more than any person is the being which has possessed them. Indeed the fact that they only occasionally lost control is a testament to their ability to control the spirit possessing them. Example" Blacksmiths in fairy tales that have magical powers, Girls who would herd sheep for the fairies, etc. In fairyland it's often the hardest worker who survives, for fairies respect and even demand hard work. So those who stumble into fairyland and are willing to work hard are often given magical rewards. Although patient with their work these witches easily lose their temper with those who don't follow the guidance of the spirits, or who are immoral. Celebrations, ceremonies, and tradition tend to have a great meaning for them, so they almost never forget important details in events or their friendships. Examples: Odin, Diana, Artemis, male practitioners of Shamanistic magic in Germanic lore. Wise warriors will suffer any agony in order to gain knowledge is more important that happiness, and many sacrifice their place in society in order to gain knowledge. For there were many spells that were limited to men or women alone but the wise warriors would ignore these rules. For example, Odin was banished for performing womanly magic as were many Germanic cross-dressing witches. Despite the fact that they fail to follow social norms Wise Warriors do have strong convictions, and they seek to protect humanity, and the nation which often derides them from outside invaders, or at times to protect the weakest members of society. They have an overwhelming need to take action, and often get themselves into trouble for instigating war when others seek peace. This is because of their power to foresee the future, and their willingness to sacrifice anything to accomplish their goals. Their spirit journeys are often filled with suffering, such as when Odin hung himself from the worlds tree, or gave up his eye to learn the use of ruins and divination. Despite being strong warriors they are also very cunning and will use guile as often as they use their skill in combat to get their way. Despite the fact that these witches seem like they should be serious their knowledge of the future, along with their constant struggle means that they need to cut loose more than most. Because of this they love wild parties and hunting difficult prey. 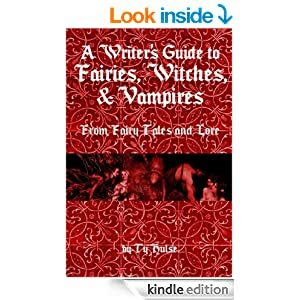 Learn more about the witches of fairy tales and the past in my book "A Writers Guide to Fairies, Witches and Vampires." "Grimm's Fairies" is a book I'm planning to launch on Kickstarter which will serve as a guide to the fairies, witches, vampires, and folk religion within fairy tales. In this book I'll discuss in detail the fairy beliefs and myths of a number of different people's including the Uralic people's of the Steppes, the Romanians, the Germans, the Celts, the English, the Northern Italians, and more. By carefully examining the fairy tales and beliefs of these people's one by one I hope to take you on a guided journey which will lead you to understand Europe's fairy beliefs of once upon a time. Of course this book won't happen without your help so please sign up to help me make this book happen when I launch it. Send an email to tyhulse@yahoo.com if you are interested. “Once Upon a Time” people didn't believe that fairies lived in some distant land, for nearly everyone had a story of encountering fairies in the lakes, forests, moores, and even the cities of their homeland. “Fairy Lands” will discuss not only these fairy tales, but the folk religion behind them, as well as the regions they took place in, and the history of the people who told them. With extensive maps to show you where different fairy encounters occurred, this book will take you on a guided journey across Europe to understanding the almost forgotten fairy realms. I'm planning on launching a Kickstarter campaign for this book, and but would like to find support for it before I launch. So please sign up to receive an email when I launch this project. This book will closely examine the stories, history, and folk belief's of many unique lands, which like a path of bread crumbs through the sylvan forest, each culture's beliefs will lead you ever closer to understanding of the fairy realm. From the alpine fairy realms of Northern Italy, to the stillness of the Eurasian Steppes, to the quite rivers of Mongolia, "A Dreamer's Guide to Fairies and Fairy Tales," will help readers understand the beautiful and often strange fairy realms. Thanks to the supporters for my last successful Kickstarter campaign I was able to publish "A Writers Guide to Fairies, Witches, and Vampires." And I was also able to get rough drafts of a number of books, including a book on Fairy Tale Archetypes and Japan's Folk Religion. I am coming back now to get these rough drafts edited, and to get another book edited on fairies across Eurasia. As a child growing up in Yupik villages I heard a lot of folktales from people who still respected them, more than this i discovered that each story I was told had a story behind it. Each fairy tale has a setting, a place which isn't often discussed in the fairy tales, because the people listening to the story knew this setting. Yet this setting is intimately important to truly enjoying the fairy tale. My hope is that learning about the beauty and fairy faith of lands such as Northern Italy, or the isolation of the Selkup villages will help stir your imagination. People used to believe in the witches, vampires and fairies in these stories. They were afraid that a wolf might take human form in order to eat them, they really did hope that a fairy would come and bless them so they could escape their ordinary life. Further in ancient times many leaders would take spirit journeys, entering the realm of fairies in order to understand the nature of humanity and the universe. So once upon a time whole societies would base their philosophies and activities on their belief in fairies, deities, spirits and similar beings. So fairy tales are not abstract morality tales, they are stories filled with the spirits people feared and credited with controlling fate which is why the word fairy at it's origin means in essence 'those who control fate. Because of this people thought a lot about and discussed fairy tales as stories filled with real beings, beings people needed to avoid or get on the good side of. So fairies and vampires were assigned personalities, given goals even if these aren't overtly stated in fairy tales. I'm including links to a few sample articles I've posted on my blog. Part of what I want to do with this project is flesh out an lengthen each of these articles and many to provide you with more information fairies. Like a horned owl the Buffardello is a creature of the night, who has started finding ways to adapt to the presence of human cities by living in barns, trees in gardens, and occasionally even human homes. Though typically they prefer to live in nut trees, creeping into homes through windows, under the cover of darkness. In lore their cunning and ability to become invisible has allowed them to thrive in the human world. Never the less, the buffardello doesn't entirely belong in the human world, they are liminal creatures caught between their wilderness home and the new habitat which humanity has created. Thus they appear as a humanoid with animal features. Some buffardello appear as having fox like features, others as cat like, or rat like or dog like features. And in Pianacci there are even some described as being like a bird with a mouse's head. Wild and mischievous in their new homes they rush about at night bouncing on sleeping people's stomach's and chests, they'll put their hands over people's mouths, pull the covers off sleepers, hide and move objects, turn on and off lights, rip paper, cut beards, tie hair in knots, and generally cause chaos. Further they can also be mistaken for the wind which rattles windows, and occasionally gusts into house through open windows blowing things everywhere. In addition to their pranks, Buffardello, like any wild animal, often take food from humans, drinking milk from cows, stealing wine, bread and on occasion they'll even attack and drink the blood from an animal like a weasel is said to do. In addition to viewing them as animals, it's likely that Buffardello can also be viewed as somewhat akin to children with no parents and no real rules. This, however, also means that while they are often thoughtless if they are forced to confront their victims, to realize the impact their actions are having they can feel very bad about it. This is demonstrated by the following tale from Casola in Lunigina. The harvest had been poor that year, and the cow had grown sickly, so it was producing very little milk. With their meager rations about to run out the young widow Giovanna set out during the coldest part of winter in hopes of finding work in other people's fields, but there was far too much snow on the ground for anyone to be thinking of work, so the young woman began to worry that she and her children would starve to death. , she began to worry that she and her young child would starve to death. When she opened the cupboard to get a bit of the last bread for her child to eat she found that the whole loaf was gone. She looked about the house in a panic, wondering how she could have lost it, but in the end could find nothing, so she prepared a watery soup with a few of the withered vegetables she had left. That night, the hunger pains were so intense that Giovanna couldn't sleep so she got up to finish making a shirt, but as soon as she stepped out of her room she heard strange noises coming out of the kitchen. When she stepped in, her candle held high she saw three Buffardello, their eyes growing round with surprise for a moment before they smashed their hands over them. "Put out the light," they cried. "It's too bright." Once she'd done as the three fairies asked Giovanna began scolding the buffardello for stealing her bread. She told them about her child who would cry himself to sleep he was so hungry, and about how she was so worried she couldn't sleep. Like little children the buffardello felt ashamed for what they'd done. They wanted to do the right thing. They promised her that if she left them alone at night she would find bread for her and her child in the morning. What's more her cow would be healthy and strong again. So the woman left the buffardello alone in the dark, and the next morning, as promised she found a loaf of bread, and a healthy cow which gave her milk to get through the winter. That spring she had the largest harvest of vegetables and wheat she'd ever had. It's likely that the buffardello stole the loaf of bread they gave to the woman from a neighbors house. For like many fairies they want to do the right thing, they just have trouble understanding human morality. And it's common for many house fairies to get gifts for one person by stealing form another. The fairies of Ireland would steal luck from one persons field to give to another, the Domovoi of Russia would steal food from neighbors to give to the family they lived with, as would the Tomte and Nisse of Norway and Sweden. As part of being childlike they have an odd relationship with children. On the one hand they enjoy scaring and playing pranks on children, but they also want to be with children and will fall asleep next to them, or at times kidnap and hypothetically raise them. The same thing is true of their relationship with woman girls, while they will typically play pranks on a girl or woman, they'll at times seem to fall in love with them. In these cases they'll provide them with food, and potions which will make them beautiful. But as with most relationships with a fairy the girl must take care not to reveal that a buffardello is in love with her or the vindictive fairy will attack them, and on occasion kill them. In the province of South Tyrol, Northern Italy, there remains a chaotic, topsy turvey festival, filled with remnants of gender bending shamanism, in the form of a man dressed as a woman acting as the wife of the spirit of spring. This is fairly typical in Eurasian Shamanism, in Japan and most other places spring festivals featured a man or boy dressed as a woman. This is because it was believed that they were being possessed by a female spirit, (a goddess, fairy queen, nymph, etc.) Men were the ones most likely to be possessed by these spirits, because this turned them into liminal figures. That is it pushed them away from human society and into the other world. Further, possession of this type was often likened to a form of marriage and so it made sense for a female spirit to possess a male person, and for a male spirit to possess a female. Though as with all things about shamanism nothing was certain. You can learn more about European Shamanism here. A thousand dogs howled, turning their heads to the red colored sky to sing out their primal song. It's nearly midnight but the sun still drags around the edge of the sky giving hours of twilight, of half light that can neither be called fully day nor fully night. Like the famous midnight sun of the North, Siberia and the Eurasian Steppes often times isn't simply a liminal world, for that would imply boundaries between humanity and the spirit world, but in this place such boundaries are never very clear, if they exist at all. Here people didn't live on the edge of the spirit world, they didn't live with 'batches' of wilderness, instead they were surrounded by the wild. Whether in their little fish and hunting camps, herding animals over the grasslands, or in the villages, the wilderness was all about them. It stretched out for a seeming eternity, and given how long it might take to walk from one place to another, at times it might has well have gone on forever. Those who step away from their home could walk for days without seeing another person, another village, or any sign that humans began to understand the vast loneliness of this land. The omnipresent wilderness is a mixed blessing, for on the one hand it's a place filled with food. The place of the hunt, and of wild vegetables and fruits to gather, of fodder for herd animals. On the other hand it's a place to be feared. So many people will go out into the wild and never return. No one will ever know what happened to them, they will just be gone. Leaving behind only whispers, rumors of what might have happened. This, perhaps, is why the spirits of the wild begin as a primal fear, for those who set foot outside the small village or off the well known routes the eternal quite stretches out before them. Sudden feelings of lonesomeness can wash over them, there are no roads, no way to contact anyone for hours, days even, if trouble should arise. Those out in the wilderness are truly alone, and they can die alone all too easily. Worse even than the feeling of loneliness, however, is oftentimes the feeling of being watched. The feeling that there is something in the trees, on the vast tundra, hiding among the rocks or in the water. Here in this lonely place witches clacked their claws in the long grass, waiting to devour children or other humans. Spirits snatched away peoples souls dragging them into the “Other World,” here one false step could send a person to a land of eternal torment. At the fork of a river was a chum (teepee) where an woman lived with her two sons. One day the woman went to gather food and never returned. What had become of her no one knew, perhaps a bear and eaten her or she drowned in the river. The only trace of her was her two little sons alone in the chum. Growing up in Yupik villages there were occasionally people who did vanish, people who were out hunting or fishing that never returned. Because of this it's actually very common for stories on the steppes and in Siberia to begin with someone disappearing forever. A boy grows up alone and wonders why he's the only person in an Evanki tale, so he sets out to find other people. Eventually he meets a squirrel who is his sister, taken prisoner by the monsters that ate their people when the boy was too small to remember. In a similar story a monster devours an entire village but for an old woman and a little boy, when the boy grows older he wonders why there are so many yurts but no other people. From such stories one certainly gets the sense that there are ghost cities, and indeed when a plague, an enemy or a storm while the people were away on the river could kill an entire village leaving nothing but creepy, empty yurts and chum (teepee like structures). Going back to the story of the two brothers left alone by the riverside, they begin to live by gathering food and fishing, until years later they decide there must be other people and that they should go and look for them. So they set out and eventually find a girl picking cloud berries. The girl takes them back to her chum and there he lives with her and her parents where they have to learn how to herd reindeer and do similar tasks. There is typically a lot more to these tales then simply a “Jungle Book” like tale of a child who is the only survivor of their people, and of ghost camps of an people wiped out by some evil spirit. For in many of these stories the boy must set out into the spirit world to seek revenge, to kill the monster that slew their family. All of these are stories about survival, however, of two young brothers trying to survive in the wild, an old woman trying to care for and raise the last boy of her tribe. This is about the dying and rebirth of a people. In a Tatar tale three brothers are out hunting when they come upon a girl who lives alone in a hut, so they adopt her as their sister. It's never said why a young girl was living alone, but presumably like so many others it's not certain, her family, her people are just gone leaving her to try to get by on her own, and she herself almost dies from the other world all around them, for she and her new brothers are neighbors with an Aeneas (a witch / vampire that has long fangs and leopard claws, who drains marrow from sleeping people). The girl meets her neighbor when she goes out to try to find something to start a fire with while her brothers are out hunting. Starting a fire was difficult without matches so neighbors would often borrow hot coals from each other to make this easier. The girls sees some smoke rising in the distance and realizes that someone must have a hearth so goes through the woods and knocks on the Aeneas's door. The Aeneas greets her saying “We are neighbors you should be my guest” so at first the Aeneas appears nice and even gives the girl some coals in a bucket to take back with her to start a fire. Later the Aeneas comes for a visit and tells the girl that she was bored. The girl happily invites her in and eventually falls asleep, while she sleeps the Aeneas drains some of her marrow and leaves her laying on the carpet. Realizing what had happened to their sister the brothers wait to ambush the Aeneas when she comes back, but one by one she drains them until the last brother over comes her and beats her until she heals everyone. There were two poor girls who discovered that they had a neighbor who was going to help them get fatter so that he could eat them. One night as they were sleeping the monster came in and patted the stomach of the youngest sister; “saying the fish will grow more abundant so that you will grow fat so that I may eat you.” The girl of course woke up and heard this but the monster didn't realize it so the next morning she warned her elder sister not to eat, but at first her sister doesn't believe her, that is until she witnesses the monster for herself. The two of them decide to flee deeper into the forest. As they run they come to a giant river, on the other bank is an old woman. They call to her to stretch out her legs so that they can run across them and escape them monster which is chasing them. At first the old woman tells them she's too busy picking the lice out of her hair, and at last the girls tell her they'll help her if she helps them. So the old woman stretches her legs across the vast river (she's clearly some sort of spirit) and lets them run across. In due time the monster follows the girl and once more the woman stretches her legs across the river, only when the monster is trying to cross on them she pulls them away and the monster falls into the river and drowns. Though the girls aren't out of the woods yet, for the old woman's sons are also evil monsters. So she has to hide them from her children. Eventually the old woman tells the sisters to escape by running up the flow of the river, though even here they encounter a strange monster which carries them off and drops them into a barn. They escape this situation only to enter the house of a frog, who warns them that her husband too will eat them. The girls began to weep for there were too many monsters everywhere they went and they lamented that there would be no escape from this. In many ways then this is a nightmare world, where a person can run and run and run and always find some other dangerous spirit. Yet it wasn't all bad, for in this world giants could be friendly as well. One giant for example helps a starving old woman cut a hole in the ice and catch fish for her and her son. Then when the old woman's poor son seeks him out the giant greats him happily, feeds him the best cuts of meat and gives him a magical bag which he warns him only to open in his home. As he's traveling back to his home some evil spirits under the ice try to get him to open the bag outside but he ignores them and when he opens up the bag reindeer herds poor out, so many he becomes the wealthiest man on the tundra. More than this he gains a beautiful wife from the bag as well. His greedy brother tries to imitate his luck but he gives into the temptation of the evil spirits and opens the bag outside so instead of reindeer wolves come poring out and they eat all his reindeer. In another case a hunter comes upon a snake who's being attacked by a bear. The snake turns to the hunter and pleads; “save me and I'll show you something wonderful at the bottom of the ocean.” When the hunter kills the bear the snake keeps his word and gives the hunter a birch box that is always filled with feasts.